Here are some of the adventures the Northeast Coast between Fulong and Toucheng has in store for you: hiking historic ridgetop trails, river kayaking, surfing and bodyboarding, cycling through a 2km-long old railway tunnel, picnicking in a cuesta-formation tidal park, walking through a highland grassland accompanied by grazing water buffalo, learning about the region’s people and geology in a beautiful museum; and taking a yacht tour to a defunct-volcano island. To access the area’s attractions, take the slow trains that regularly ply the coastal railway. To get from Taipei City to Yilan County and further down along Taiwan’s east side, trains do not travel “as the crow flies” in a straight line. The rails first head northeasterly toward coastal Keelung City, then swing down and pierce the mountains to get to the ruggedly beautiful Northeast Coast, with the blue Pacific Ocean on one side and towering mountains on the other. Following, we’ll ride the slow trains (Local Train) that travel between Taipei City and Yilan City, stepping off at the last group of stations before the tracks spill out onto the Yilan Plain at the town of Toucheng. Our first, most northerly stop is the village of Fulong. As you exit the train station here, you’ll see Provincial Highway 2 – the coastal highway – directly ahead, past the station-front cluster of small eateries and bike-rental outfits. During this rail foray, wherever you alight the highway will never be more than a short walk away. Fulong Beach and Longmen Riverside Camping Resort are just across the highway, off the northern edge of the village. The golden-sand beach, northern Taiwan’s most popular, is located where the placid Shuangxi River empties into the ocean. This is a frolicker’s little paradise, very busy in summer, with lifeguards on duty and surfboards, bodyboards, kayaks, and other water fun equipment for rent. The camping resort, just upriver from the beach area, has the most comprehensive array of facilities of all campgrounds in Taiwan. There are board-camping, car-camping, and cabin areas, cycling facilities, a BB-gun shooting range, a water-activity area, and a kayaking center (with lessons and guided river outings offered). Be sure as well to visit the Fulong Visitor Center, between the beach and the highway. 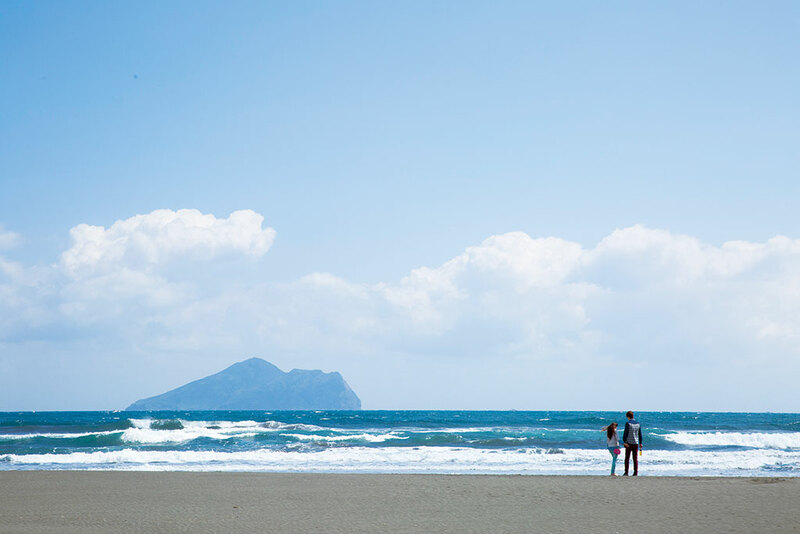 It’s run by the Northeast and Yilan Coast National Scenic Area Administration (www.necoast-nsa.gov.tw); all sites recommended in this article are under its jurisdiction. 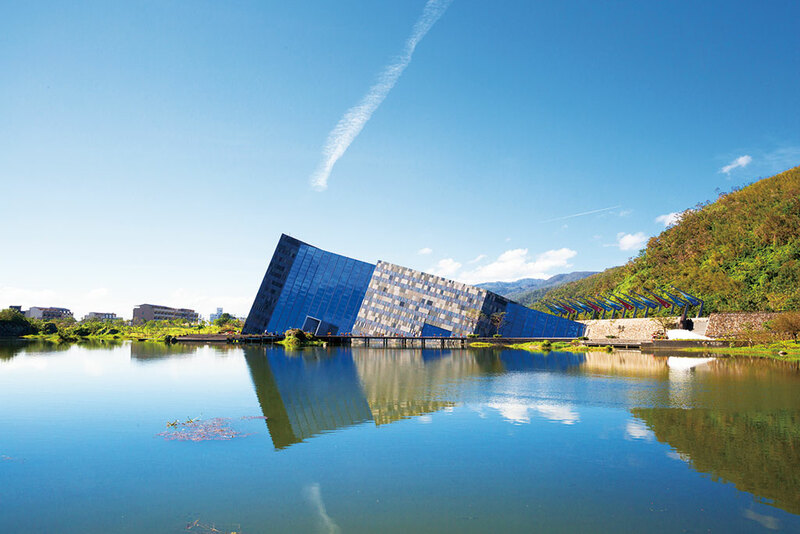 One of Taiwan’s most comprehensive visitor centers, an ocean of information awaits you on the region’s natural, cultural, and scenic attractions. Back in the train station area, rent a bicycle and head off for the Old Caoling Tunnel. This is the prime highlight on the Old Caoling Trail Circle-Line Bikeway, a 20km circuit of Taiwan’s rugged easternmost peninsular that is among northern Taiwan’s premier cycling routes. Turn right outside the station and follow the narrow road that parallels the railway tracks. The tunnel is up a verdant farm-speckled side valley. Completed in 1924 and retired in 1985, the former railway tunnel is a 2km-long piercing of the mountains between Fulong and Shicheng, the next station on our trip. Avid hikers will be interested in the Caoling Historic Trail. This is a section of an old imperial-era system of trails that connected the North Coast, the Taipei Basin, and Yilan County. Its north-end point is south of Fulong, and it ends in Dali, two stations further south. Turn left when exiting Fulong Station, walk parallel to the tracks for about 100 meters, then take the underpass you’ll come to, heading inland. Good bilingual signage will guide you along minor roads all the way to the trailhead. Give yourself about five hours to accomplish the cross-peninsula low-mountain walk, which serves up amazing coastal overviews. Trains from Fulong burst out from inside the peninsula mountains above a cliff right at the rocky coast, with the coastal highway directly above the tunnel mouth. The slow trains stop mere seconds later at Shicheng. As your train emerges, look left. You’ll likely see cyclists. The Old Caoling Tunnel has been right beside you all along. 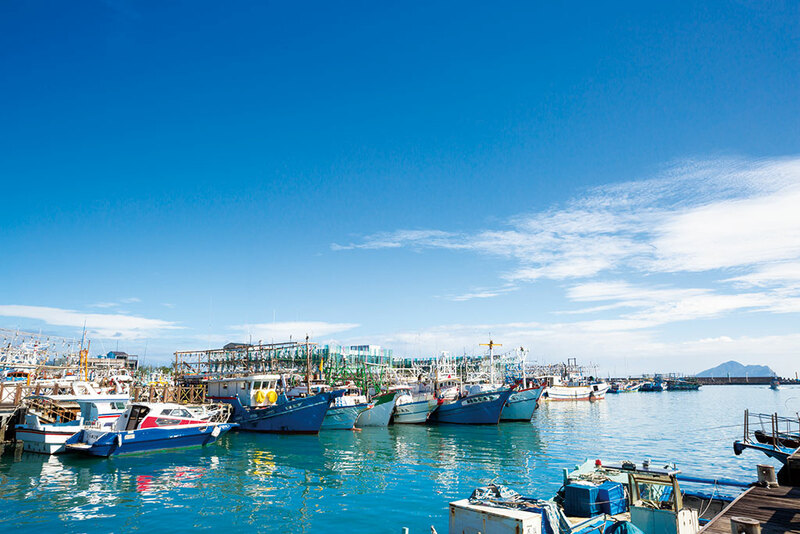 Shicheng is an eyes-half-closed place with a pleasant, somnolent fishing harbor. Walk from the station back to the old tunnel’s mouth (10-minute walk on the highway) to enjoy the café and lookouts at the bikeway rest area there. You can get right up beside the new tunnel’s mouth. The view of trains from the north bursting out of the tunnel is dramatic, but train buffs will understand the description “beautiful” for trains coming from the south. When they suddenly appear they are already in a sharp turn and are running at a tilt, presenting the engine and carriages in all their kinetic glory, with the far-off coastline and mountains as video/photo-perfect backdrop. At Shicheng travelers also get their first view of Guishan Island (Turtle Island), which will be on the horizon at almost all times all the way to Toucheng. Floating about 10km off the coast, and indeed looking like a turtle with its head bobbing from the water, this is an extinct volcano known for its precipitous cliffs, craggy peaks, sulfurous springs, and remnants from a defunct fishing village and military presence. Tourist visits are possible, as you’ll see further down. At Dali’s railway station, look inland and you’ll see a high ridgeline running parallel to the coastline. This is where the Caoling Historic Trail comes down to the coast at its southern end. From the train station, walk north along the highway about five minutes to the large, brilliantly painted Qingyun Temple complex. The temple – the first version built in 1836, with numerous refurbishments since – is dedicated to the Jade Emperor. The Caoling Historic Trail south-end trailhead is beside the temple. The trail takes you up to the ridgeline and Yakou, “the Pass.” Many people just do this part of the trail, because it is the most scenic. If coming from Fulong, Yakou is the first spot from which Guishan Island and the Pacific Ocean can be seen. 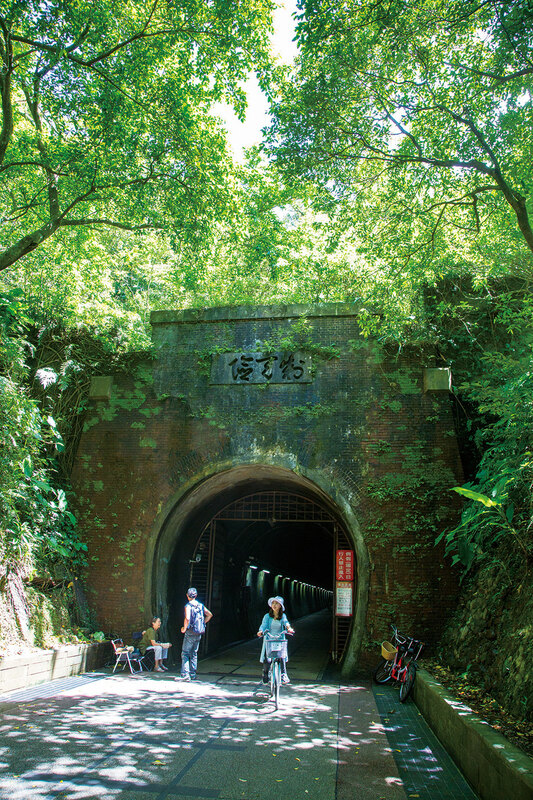 Another popular hike is to take the branch trail that starts at Yakou and heads south across the ridgetop and descends to Daxi, the next train stop. Along the way is the captivating Taoyuan Valley, a vast grassy highland area that is home to grazing water buffalo. It is spread out along slopeland on the ridge’s inland side, with gorgeous 360-degree views. 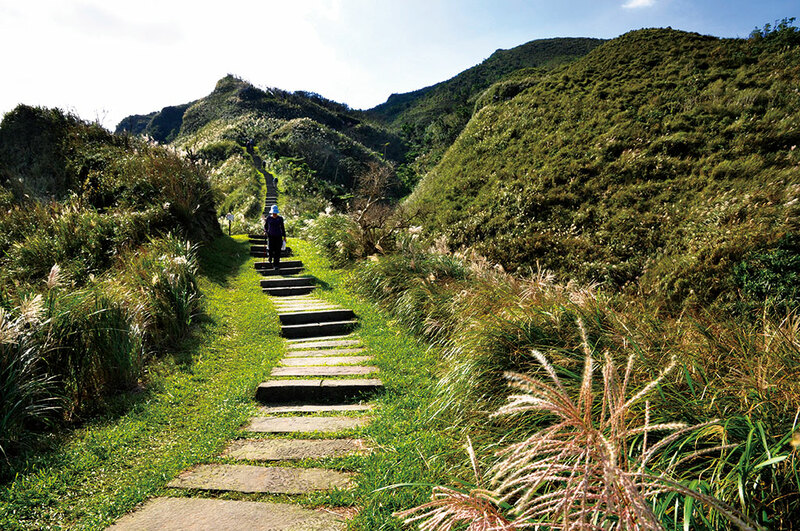 Allow one-plus hour to get from the temple to Yakou, five hours for the full temple-to-Daxi traverse. The highest point on the trail is Mt. Wankengtou (616m). To get from Daxi station to the south-end trailhead of the Daxi-Taoyuan Valley-Dali trail, walk about 800 meters north along the highway. After crossing a small river, enter the Daxi Riverside Park. Your ascent begins here. Daxi village sits on a wide horseshoe-shaped bay called Honeymoon Bay, which has a sandy area toward the southern end. 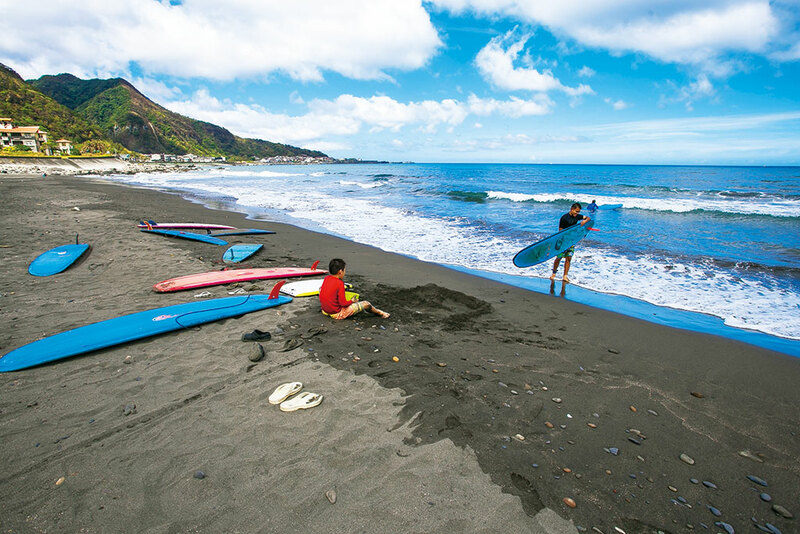 This region has northern Taiwan’s best surfing, with waves two meters and higher, and this beach attracts more hard-core surfers. The reason is that it has been left largely undeveloped, keeping crowds down, meaning more room out on the whitecaps. Surfboard and bodyboard rentals are available in the village. Walk about 10 minutes north along the coastal highway from this station and you’ll arrive at Beiguan Tidal Park. Those with an interest in geology will much enjoy this attraction, which features pathways through tofu rock and impressive sandstone cuesta formations that soar high above the shore. Tropical fish of beautiful color, along with other saltwater denizens, can be viewed in the rock pools at low tide. If the beach at Daxi is undeveloped, Wai’ao Beach is the opposite. There’s a pronounced party atmosphere here. The northern end of this wide, long black-sand beach is directly across the highway from the train station. The big action, however, is down toward the southern end – a breakwater just beyond accentuates the waves here. Surf-gear shops, cafés, guesthouses, and other outlets cater to the beach-bum crowd (besides rentals, the shops also provide surfing lessons). Beyond surfing, there’s also bodyboarding, jet-skiing, and banana-boat rides. There is a parasailing base on the hill behind the beach; check at the beach-area visitor center about instructor-accompanied tandem flights. Toucheng’s big tourist attractions are just outside of town, to the north, beside the coastal highway. Walk there from the train station in about 20 minutes, or take a bus from the station (no. 131, 1766, or Red 1). The Lanyang Museum (www.lym.gov.tw) is a striking work of architecture. The grey-tone structure seems to shoot out of the ground, mimicking this coastal area’s natural sculptures of exposed stratified rock. 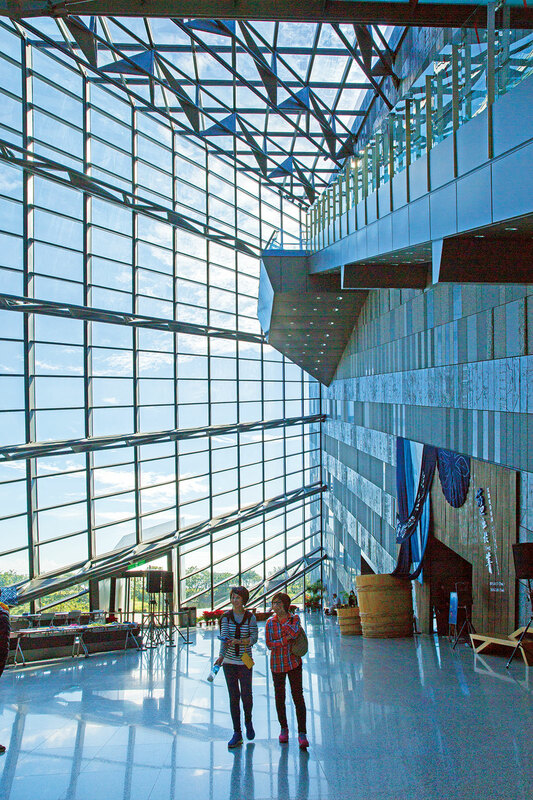 The museum explores the heart of Yilan, telling the story of its indigenous and Han Chinese peoples from past to present, and explaining the local geology, farming and fishing traditions, as well as the biology of the local land and sea. Walk the pleasant path that encircles the lagoon behind the museum, which is busy with avian comings and goings. This was the site of the original Wushi Harbor, once Yilan County’s largest port. Opened in the early 1800s, by the latter 20th century it was ruined by sedimentation. Beyond it is the new, manmade Wushi Harbor. The north-side breakwater of the large port is in fact the breakwater mentioned in the Wai’ao section. Yacht tours to Guishan Island launch from the harbor near the museum, from March through November. For more information about trips to the island, visit en0963499016.tw.tranews.com. Finally, before boarding your next train in Toucheng for whatever your next destination is, take a stroll through the past on short, narrow Toucheng Old Street (Heping Street). Just walk two blocks straight ahead from the station exit. Imagine the hustle and bustle of days long past while viewing the Qing and Japanese imperial era architecture, when this was Toucheng’s main commercial thoroughfare.